STRAIGHT FROM THE DEVS: Haarlem, The Netherlands, December 13, 2017 – Publisher Iceberg Interactive and developer Coronado Games announce the release of the ‘Artificial Humans’ content update for their space ship building simulation game Starship Corporation (PC). 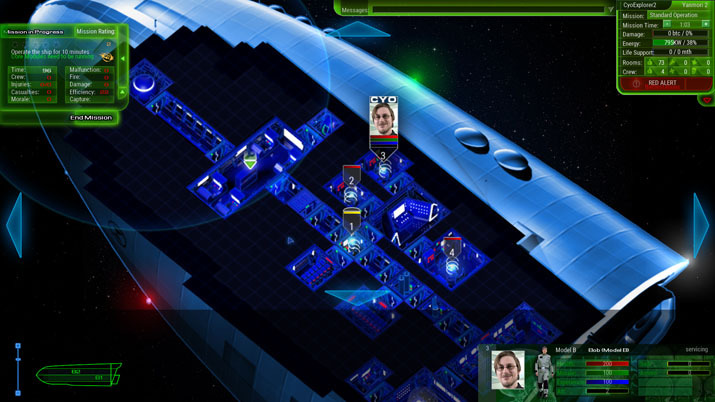 Starship Corporation is currently available through Steam’s Early Access Program. The Artificial Humans’ update adds a new type of crew member: Cybernetic Organisms (CyO). CyO’s do not require air, water, food, healthcare or life support. They can practice any profession and are built to last. If damaged, all they need to do is return to their pod. However, technological advancements such as these come at a price. CyO’s require lots of research and have a high production cost, and if they malfunction they are almost unstoppable. How will you handle a rampaging killing machine threatening to destroy the beloved starship you are building? A new crew management mission has been added that will test the counter-measures of your ship for just this type of emergency. Decide for yourself if you want to strengthen your crew by adding an artificial human, or if you prefer human error over the threat of malfunctioning, rampaging CyO’s. The update also adds 10 new contracts for completely automated ships to the market. The 60 contracts currently available in all different areas of space travel can now be approached in a new way, due to the introduction of CyO’s. In addition to new content, several bug fixes took place. A detailed log of bugs fixed can be found on the Starship Corporation Steam community HUB here. 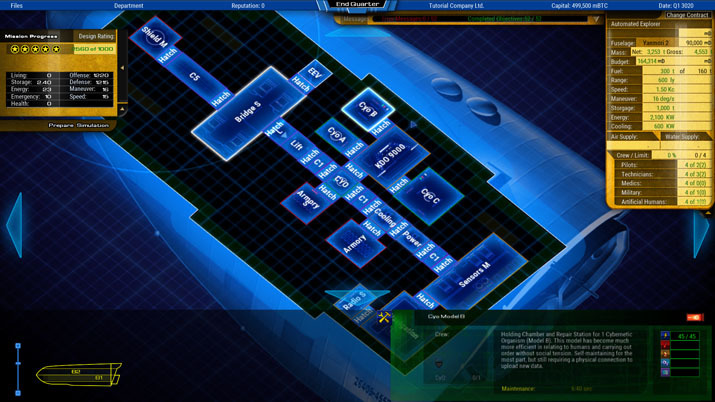 Starship Corporation launched in Steam’s Early Access program in 2016 following a successful Indiegogo campaign, in which over 300% of the goal was reached. Interested entrepreneurs can currently purchase or wishlist the game through Steam. Starship Corporation is a starship-building simulation game in which you must design and build spaceships for a hugely demanding and competitive galaxy-wide market. You decide how to run your company: which technologies will you decide to invest in first? Where will you open new shipyards? And where will you establish new markets? Develop you entrepreneur skills and lead the market, by triumphing in RTS missions and simulated emergency and combat situations. Starship Corporation is currently being developed in Early Access with community feedback. Iceberg Interactive is an independent video game publisher founded in 2009 by an international group of games industry veterans and is located in Haarlem, The Netherlands. Staffed with avid gamers, Iceberg works closely with an international assembly of game developers, both midsize and indie. Having enjoyed recent success with titles such as Starpoint Gemini Warlords and Oriental Empires, the company has many exciting games in the pipeline, including The Last Crown Blackenrock (PC), Starship Corporation(PC), Lord of Rigel (PC) as well as Gas Guzzlers Extreme (PS4), Conarium (PS4/XB1) and Antigraviator (PC/PS4/XB1).